Families will find hours of fun at the Alltech FEI World Equestrian Games in the Kids Zone area of the Equine Village. The Kids Zone is a special and interactive area designed for fun and education for all ages. This special area is anchored by the EquiMania Education Centre from the University of Guelph in Canada. Children and adults alike will be able to braid a horse’s tail and dig for bones. They will also meet SEMORE and QUATTRO, life sized horse models created to educated children the anatomy of the horse. 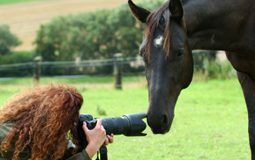 Families will be encourage do further explore the world of horses with areas dedicated to rider safety, horse welfare, and horse careers. In addition to the EquiMania exhibits, families can see what it is like to be a real cowboy chasing cattle on a mechanical cutting horse. This fantastic exhibit has multiple levels and will appeal to the young child or the professional cutting horse trainer. The American Shetland Horse Association will also assist with live pony activities. 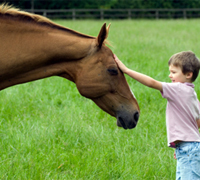 Children will have the opportunity to pet and brush a pony under safe supervision. Molly, the pony who survived hurricane Katrina and now has an artificial leg, will also be in attendance. In addition, the Native American Village will entertain and educate visitors about the culture, music and horses of our country’s original citizens. This area will feature an authentic teepee, drummers and story tellers. Several acts will showcase various equestrian disciplines at a kid-friendly level. The National Youth Harness Horse Association will be putting on demonstrations to introduce everyone to the wonderful world of driving. The talented young equestrian Lizzie Turband and her pony will teach fans about trick riding. The California Cowgirls, one of the best drill and trick riding teams in America, will be on hand to delight and answer questions from aspiring cowgirls. Access to the Equine Village and Kids Zone will be available with a Grounds Pass or a competition ticket. Grounds Pass ticket sales are going on now at www.alltechfeigames.com/tickets, at any Ticketmaster outlet, and at 1-800-745-3000. Tickets will be on sale at a promotional rate of $20 until May 31st. Grounds Pass tickets will be priced at $25 after that time. All children 12 years of age and under will be granted free entry with a paying adult. Sounds great for the kids.